Fully expansive, all encompassing and infinite tones sing from this sensational luminous bowl with a mirrored softness of golden twilight. Designed to invoke circles within circles, its gong-like round bell shape produces multiple overtones with a spiraling cosmic chime. The brilliant gold ingot qualities can attract abundance and an effortless life. A master healer, Gold balances the heart center and opens third eye/crown chakras. 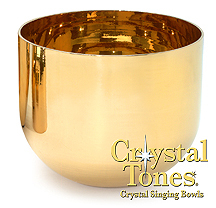 The Solid Gold Bowl is a crystalline peace bell, the Xanadu of sonic intention and resonance.